INDUCTION: The Wyatt Compound Match - Final Deletion This Ain’t - WrestleCrap - The Very Worst of Pro Wrestling! It may sound insane, but my favorite wrestling “match” over the past several years wasn’t in WWE – it was on Impact of all places. You know, that company that everyone is shocked to hear is still alive. It was completely amazing, and even if you never watch that show, you most likely still may have seen it. Sorry, my bad. That would be Rebel vs. Shelly Martinez, and that match was horrible. So much so that I inducted it a while back. Trust me, it’s worth checking out if for no other reason than Rebel’s ring entrance GIF. Fully expect to see that GIF as avatars on geek forums across the inter webs this upcoming weekend since I just plugged it again. Don’t let me down, shut-ins! Ok, so it wasn’t Shelly vs. Rebel, it was of course Matt Hardy vs. Jeff Hardy in Final Deletion. If you’ve never watched it, do so now. It’s amazing in about ten billion different ways. Matt had created a memorable character being “broken”, and brought in family members (his wife Reby, son Maxel, father-in-law turned gardner Señor Benjamin) to join the fun. It was a true breath of fresh air in a business that has been incredibly stagnant and repetitive, and his battle with Brother Nero (Jeff) took everything to an amazing new level. Goofy, funny, and so out of left field that it left folks like me in awe. Of course, I wasn’t the only one to enjoy it – folks in WWE did as well. So much so they decided to try their hand with their version, which took place on Raw on July 11, 2016 and featured the Wyatt Family vs. The New Day. And you won’t believe it, but it absolutely stunk. For starters, the pairing of the creepy Wyatts and The New Day didn’t sound good on paper. Villains that are portrayed as total creeps versus a complete comedy act? Oil meet water. Ya ain’t gonna mix. Regardless, it’s the feud we got, with Bray challenging his foes to meet him at the Wyatt Compound for a battle. So we get spooky music, and New Day showing up in a dark field. They are immediately greeted by a girl in a sheep mask. At least I think it’s a sheep. And I think it’s a girl. Maybe Kendall Windham dyed his hair brown and he’s a lamb. Or maybe it’s Kendall Windham on the lamb. You know, for counterfeiting. I just worked way too hard for a joke referencing something took place 28 years ago and that literally no one is going to get. Please, kids, let this be a warning: do something better with your brain than memorizing old rap sheets on professional wrestlers. 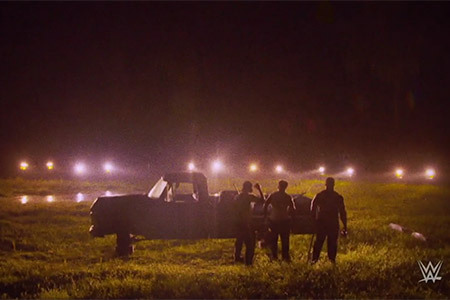 Shunning the girl, the New Day are then blinded by several cars lined up in the field with their brights on. 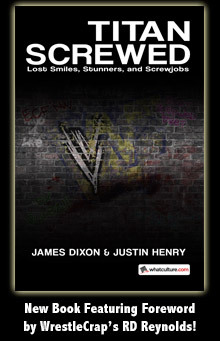 Anyone else having flashbacks of other terrible WrestleCraptactular events such as the IRON CIRCLE (available in the archives) and that time Sid Vicious lost his car keys (available here)? Again, that latter one is well worth your time to check it out for an animated GIF, but instead of lovely Rebel showing her talents, we get Sid showing his in the form of his mighty windmill punches. Sid is awesome, no question, but I have to be honest and say the one with Rebel was better. Back to the match, a car goes vroom vroom and runs into another car, with the New Day deftly stepping out of harm’s way. They then wait patiently as the Wyatts get out of a slick looking blue silver low rider. No idea what kinda car that is (maybe an Impala? ), but I sure hope they don’t smash that crap out of it for the sake of this stupid match. I do like the fact that the video features ‘scratches’ and film glitches, all while in otherwise pristine 1080p. That’s the earmark of a current day WWE production – taking something that makes no sense and somehow fashioning it so it makes even less. Bray playing Johnnie from The Shining, complete with axe. They then run around the tree like two kindergartners. I was legit waiting for Bray to start crooning Ring Around the Rosie. Pretty sure that wasn’t in the movie. The children play in the mud next, splashing crap all over the place. Again, this is being played 100% straight, with no comedy. If Matt had been there, for sure there would have been a Slip n’ Slide, and probably had the wacky music from the commercial in the background. As Braun fights to regain his vision, we get a still shot of him smiling at us. Yeah. I don’t know either, dude. And why does that still picture of Braun just scream Glamour Shot? Running into a stationary object so his opponent can take over. I’m trying to get confirmation on this, but rumor has it that is coming to WWE 2K18 as part of a “Big Guys Doing Stupid Things” DLC pack. 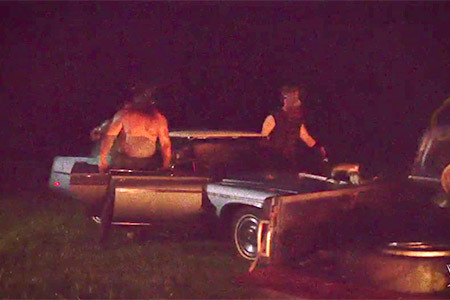 The Wyatts eventually gain the upper hand, laying Xavier out on a car hood. Bray tells Braun “UP!” and he gets atop a different car, looking to do a Superfly splash to end this once and for all. Sadly before he can do so, he is hit by…something…and just falls down gently to the ground. I’ll leave it to you decide whose version of the dialogue was better. The thought of all those LED bulbs causes the New Day to run for their lives, and the match or whatever it is comes to a screeching halt. 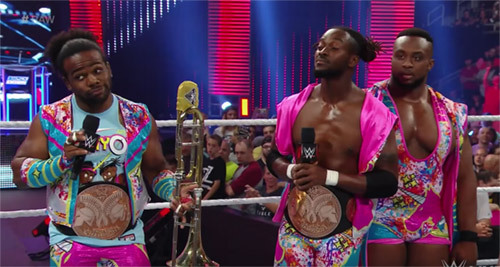 Back to the announce crew we go, who go mental talking about how the New Day may never recover from this. JBL tells us that he’s been in the business for a “quarter of a century” and there’s never been anyone as scary as the Wyatts. Would the New Day be able to return to the ring? If so, would they be permanently scarred? Well of course not, silly. If you answered “I bet they show up the next week on Raw making Pokemon jokes”, step up and claim your prize! As noted at the beginning of our fun today, this all started with something great: Matt Hardy’s Final Deletion. It led to something atrocious, namely this induction. According to this past week’s Raw, we will be getting Bray Wyatt vs. Matt Hardy at the Hardy Compound. Apparently it’s being dubbed the Ultimate Deletion, and may be headed for WrestleMania. Will it be great? Will it be terrible? I love Matt Hardy, but Bray Wyatt & WWE have ways of making things go their way. And one has to believe that Bray Wyatt may feel slighted for not winning a Gooker we thought he had totally wrapped up. Yeah, pretty sure we know which way this is going to go. Get those projected maggots at the ready, kid! Thanks for reading this induction! If you would like us to generate even more crappy content, we urge you to support us via our Patreon page! You’ll get heads up on what is hitting the site before anyone else, and most importantly, you will help us keep WrestleCrap alive. Just a couple bucks a month gets you into our little club. Thanks so much for helping us out! 22 Responses to "INDUCTION: The Wyatt Compound Match – Final Deletion This Ain’t"
And last week had a guy in military gear intimidating a Jewish man. PC Principal would have an aneurysm. Uhh….What’s wrong with this, considering the guy in the military gear is of Polynesian descent? Is it meant to harken back to all those horrible points in history where Polynesian people discriminated against Jewish people? You apparently don’t remember the Samoan-Israeli war of ’92. It was 100% fine for “modern TV viewing.” The only problem was how bad the final result was. Damn Wyatt Compound you scary! That would be great if Sid, Rebel, Shelly, and Scott Steiner all showed up during the Ultimate Deletion. 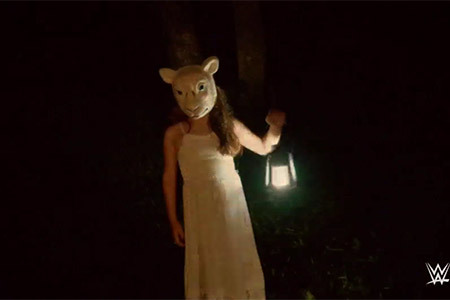 Pretty sure from the hair that Sheep Girl is Bray’s sister and perennial Sister Abigail rumor Mika Rotunda. It’s quite telling that I remember the match but forgot that Strowman was still in the Wyatt Family at the time. There’d been a Wyatt Compound in their earliest promos so it was always a storyline beat there to be exploited, but the timing of them actually doing something with it… yeah. I thought it was Jojo, the one that Bray allegedly deflowered to fuel his unwillingness to pay spousal support. 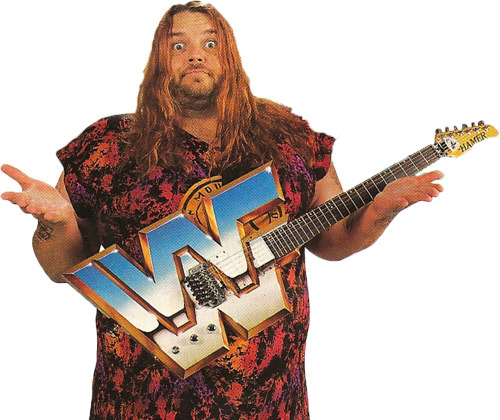 You saying this made me look up the whole Wyatt divorce case and apparently it’s not her but now I know that Wyatt’s first name is Wyndham, and I’m amused. The only thing that could have saved this a little would have been a page from Total Deletion when Jeff/Nero drowns and emerges from the water as his alter-ego, Willow. Imagine Bray Wyatt being sunk in a pool or a pond (I think a pond would be better for him) and reemerging as… Husky Harris!! THIS, this exactly why don”t want another deletion in our minds, hey, WWE is known for that sruff. Let’s be fair the Wyatts had been reduced to comedy act by the time they fought Kane and Undertaker at Battleground. Wait… Was Big Poppa Pump using a Squeegee against Sid? Was that a rib? The Wyatt compound match was absolutely horrible, and deserves to be on Wrestlecrap. And it was still better than the Final Deletion. That is the absolutely shittiest angle in years, without a single redeeming qualities, and it’s all highlighted by the Final Deletion match itself. There is not a single good thing to be said about “Broken Matt Hardy,” or anything connected to it. It’s an embarrassing low point of the industry. Jim Cornette, Is that you? Yes, far more embarrassing than the thought of gimmicks, which were portrayed as serious (as opposed to “Broken Matt”, which was always supposed to be camp) such as a wrestling garbage man, Mantaur, Bastion Booger, etc. etc. etc. I didn’t mind this Wyatt Compound match. I don’t know why everyone hated it so badly. Was it great? No. I didn’t see anything about it that screamed “horrible” though. 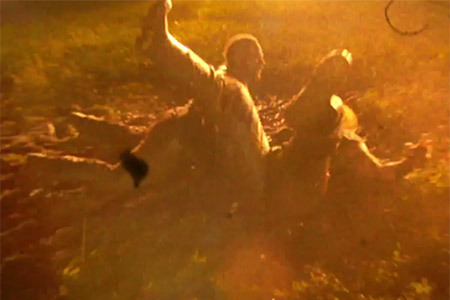 The WWE was trying to create a “grindhouse” style horror romp. It’s not a bad direction to go with the Wyatts. Unfortunately, the idea that the Wyatts were in any way creepy and not just jobbers at this point was pointless. I guess what I’m trying to say is, measure this harmless segment versus the House of Horrors, and the context of this induction changes quite a bit. I have to give Xavier Woods props for his acting, but the rest of this was so..inconsequential. It’s prime evidence of how bad the company’s been at capitalizing on the eerie atmosphere the Wyatts had when they first debuted. a) It to NOT be a blatantly transparent attempt to piggyback off the success of the Final Deletion. b) The Wyatt Family would have not to have already been rendered completely ineffectual by horrible booking. c) The New Day would have to have, as you said, come back shaken and near-traumatised and absolutely terrified of crossing the Wyatt’s again to give the encounter some weight. Unfortunately WWE completely failed on all 3 criteria. Honestly, if they’d come up with this idea on their own 3-4 years ago, before the invention of Broken Matt Hardy and done it with the Shield instead of the New Day during their feud with the Wyatt’s while they were at the height of their terrifying power, this segment might have become legendary (seriously, imagine Bray, Harper and Rowen going at Roman, Dean and Seth with pickaxes in a dark wood). As it was, it was all wrong, too late, and blatantly obviously chasing someone else’s bandwagon.